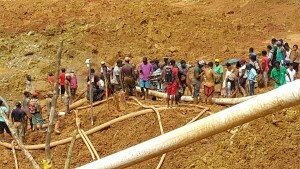 A gold mine in western Guyana where 11 persons were killed last year when a mining pit collapsed would remain closed because the head of the operation has failed to put proper systems in place to avoid a recurrence, Minister of Natural Resources, Raphael Trotman announced Sunday. “We are not going to disrespect the dead and just open that mine unless we are satisfied that what caused the accident in the first place will never happen again and that the right practices are being observed,” he told a meeting of residents of Mahdia at their township. Seven persons were injured and 11 others died on May 18, 2015 at Mowsie/Pepper Creek, Konawaruk where a mining pit collapsed. The mine operator had filed an injunction preventing Guyana Geology and Mines Commission officers from entering the claim which was the subject of a legal battle. Trotman also announced that another mine at Jumbie Creek in September, 2015 where one miner died in a pit collapse would be reopened and used as a model. “We have given permission for that one to be reopened… Many modifications have been made and it is supposed to be held up as model on how to mine, how to ensure the walls don’t collapse and so forth,” said Trotman. Noting that Junior Minister of Natural Resources, Simona Broomes has been appointed to address welfare issues, Trotman said among the expectations of all mine operators/concessionaires has to be compensation for surviving family members. A Commission of Inquiry into mining pit accidents has recommended that family and dependent issues, especially after an accident, need to be addressed by ensuring that the sector has access to Liability Insurance or a compensatory mechanism with clear guidelines for implementation. The Commission has found that many mining pit accidents have been caused by negligence, poor occupational safety and health practices, ‘chasing gold mentality and corruption. Responding to a call by miner for more lands to be allocated to pork-knockers (small miners), Trotman said a Lands Commission would established by March 2016 to review all mining, ancestral and other lands in keeping with an order by President David Granger. “Thisis the national patrimony of Guyana. Everybody has a right to some of it. Some people have too much, some people have too little. Everybody has a right to some,” he said. Sunday’s meeting was the first with miners since the appointment of Trotman and Broomes as ministers of natural resources.